It was a beautiful drive to California. 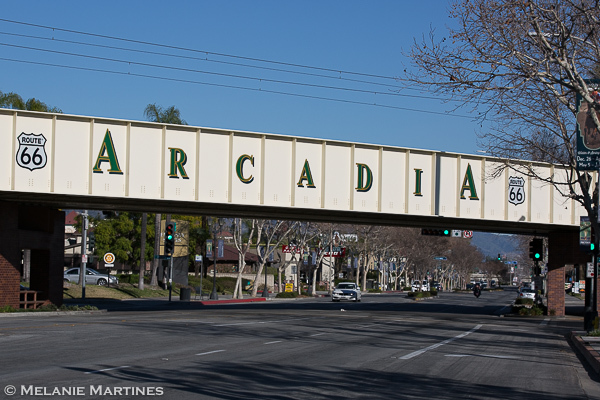 The weather forecast for Arcadia was sunny and 80, and I could not have been happier! 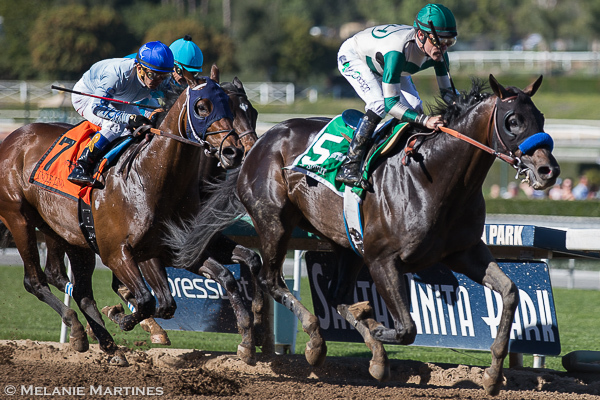 I was very excited to be there for Champion 3-year-old filly Songbird's 2016 debut and to see Kentucky Derby hopeful Mor Spirit, for the very first time. I had heard many great things about this colt, and I was hoping I'd get to see how special he is. 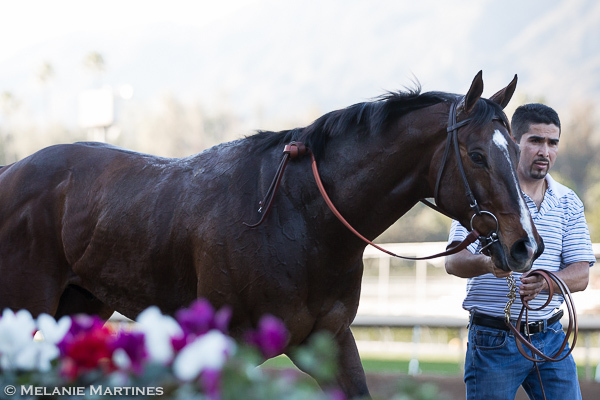 Going off as the morning line favorite, he was the one to beat in the Robert B. Lewis Stakes. 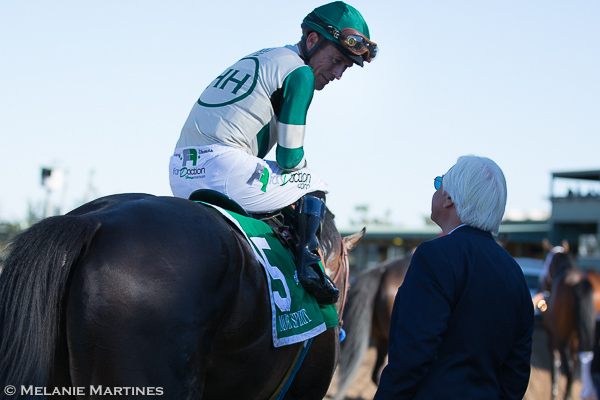 Expectations were set high for these two superstars, and with a race card full of graded stakes action, where do I begin? 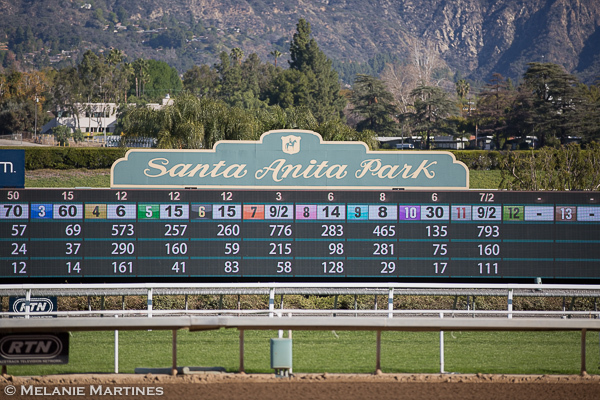 Saturday's race card was filled with four graded stakes races! 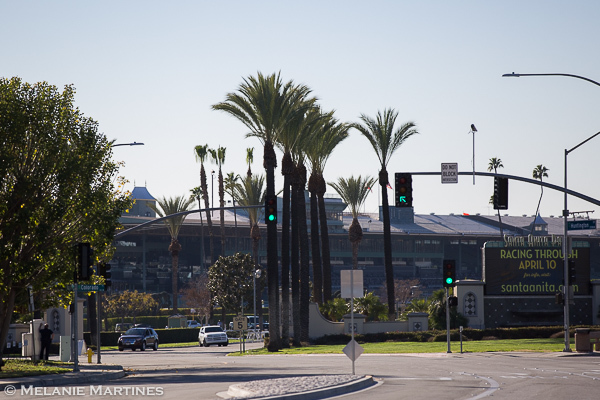 To my surprise, there was not a very large crowd that came out for the day, but for the racing fans that did show up ... I can tell you they did not leave disappointed. 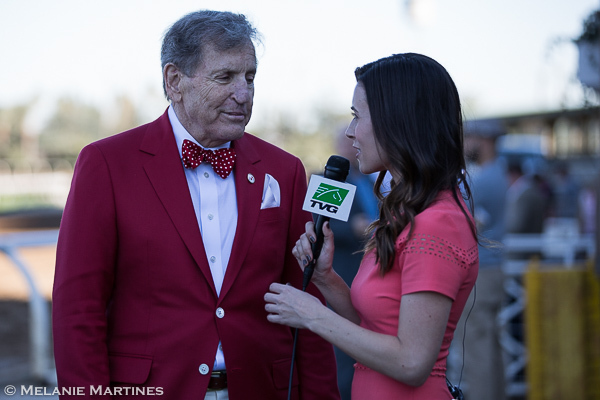 It's that time of year when we start to explore the 3-year-old-year circuit in hopes of finding that special horse that gives us hope for another year of of big dreams, and Derby Fever. 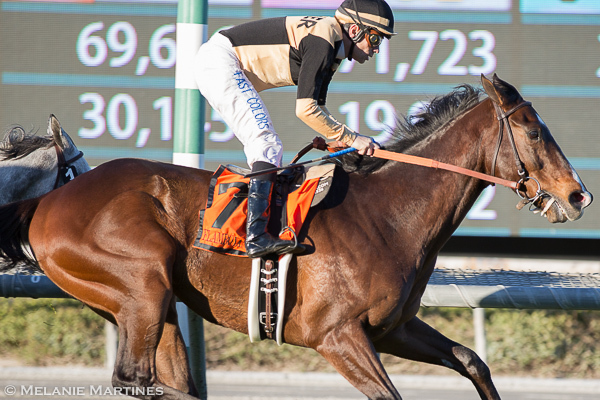 With the prep season under way, and the 2016 Kentucky Derby point system; it's crucial for these horses to get on the leader board. 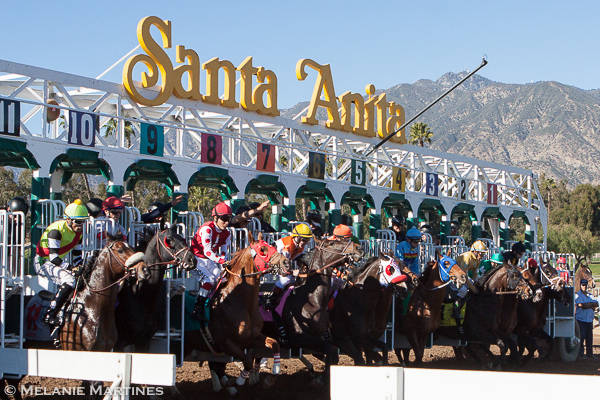 Only the top twenty horses in points will make it to the gates on the first Saturday in May. The target is in sight for owners and trainers, but it's still a long journey there. 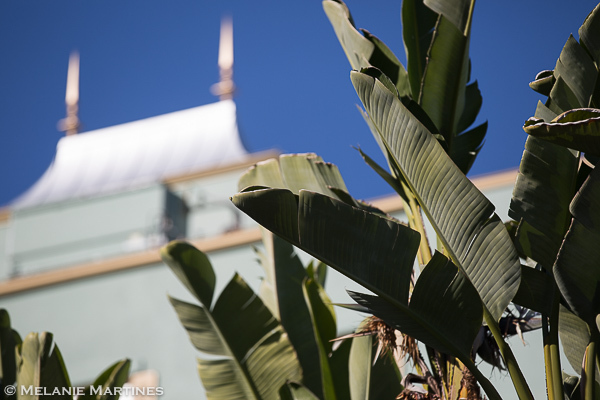 Like cream rising to the top, the weeks ahead will be generating buzz and excitement at race tracks around the country, and so let the good times begin! 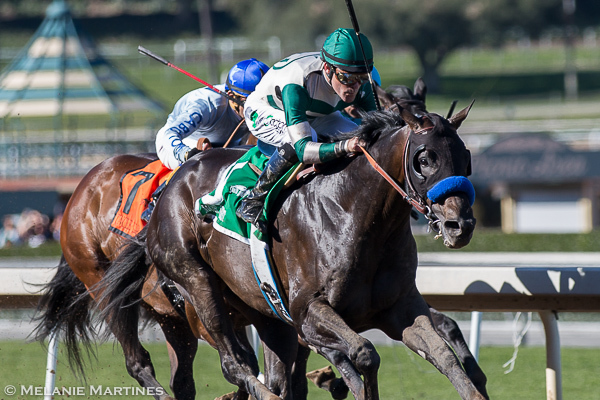 Graded stakes action started with Race 4, the 79th Running of the Grade 3 Robert B. Lewis Stakes. #4 Laoban was scratched from the race. 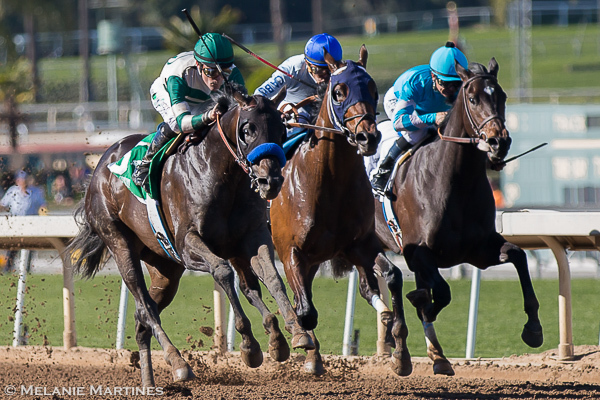 The top four finishers would receive 10-4-2-1 in points toward the Kentucky Derby point system. 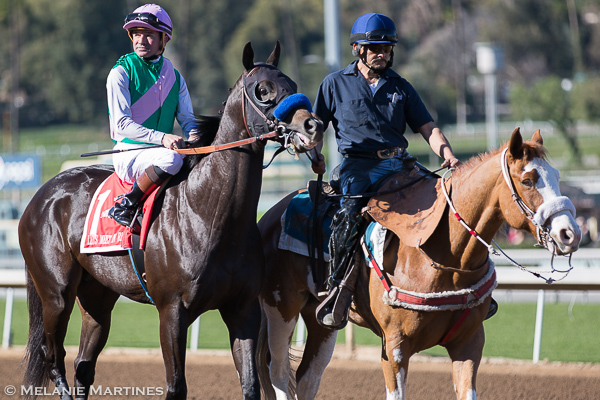 Since we may see these horses again in other prep races, here is the field. 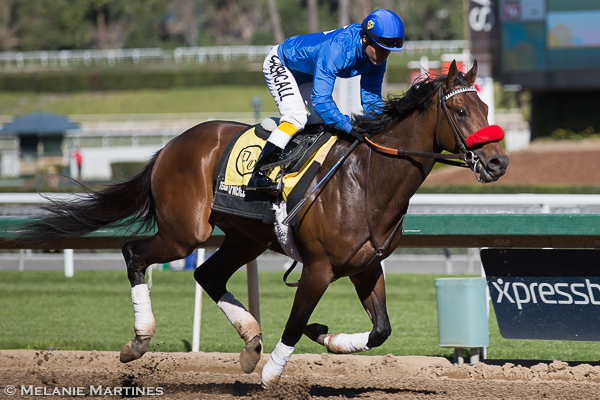 #1 Lets Meet in Rio is one of two Baffert trainees in the race. He was troubled in his last two outings. On paper the pace looked to benefit his running style. 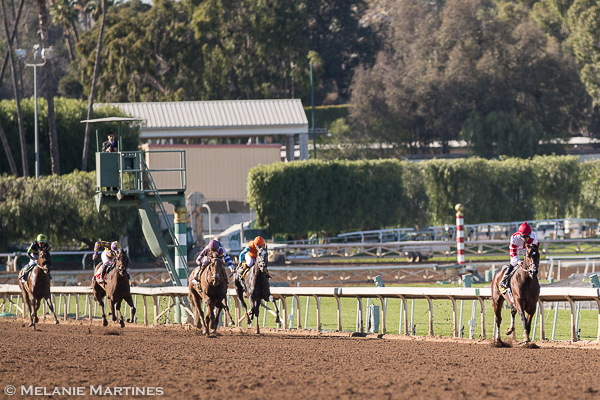 Here is #2, I Will Score came into the race with a pair of best morning workouts. #3 Dressed in Hermes, a colt who has yet to win on dirt. 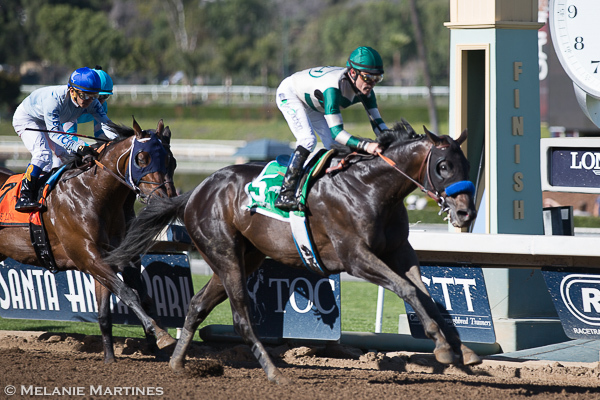 #5 Mor Spirit, another Baffert trainee in the race, won the Los Alamitos Futurity on December 19. 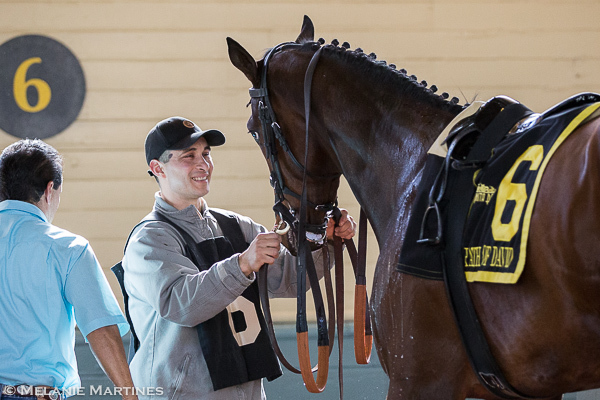 I captured a candid shot of #6 Path of David with his groom getting saddled up and ready to go in the paddock area. 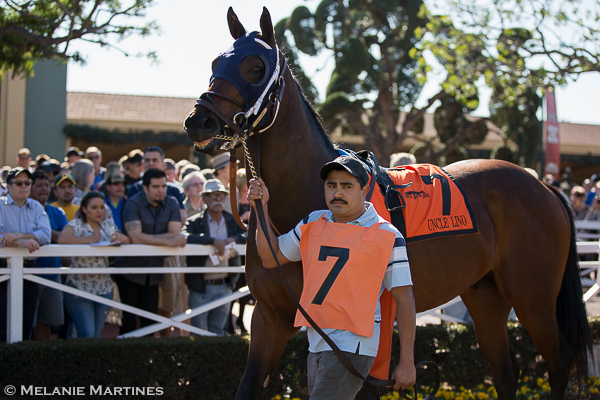 Doesn't #7 Uncle Lino, by Uncle Mo, look gigantic in this photo?! #2 I Will Score went straight to the lead with #7 Uncle Lino keeping him company. 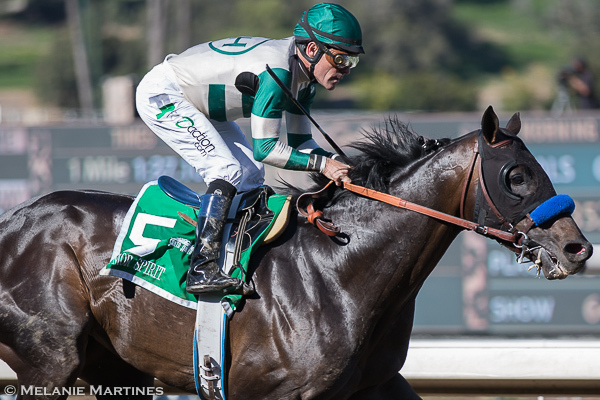 #5 Mor Spirit patiently stalks the pace. 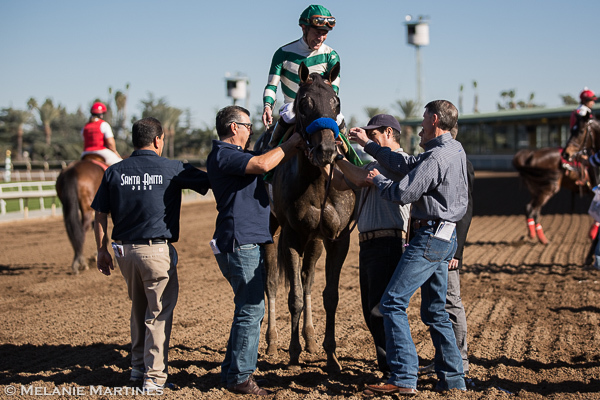 Jockey Gary Stevens on Mor Spirit, "I was loaded going into the stretch. He's pretty special and I'm looking forward to facing more competition." "He seems to just do enough for what's in front of him; he likes a target. 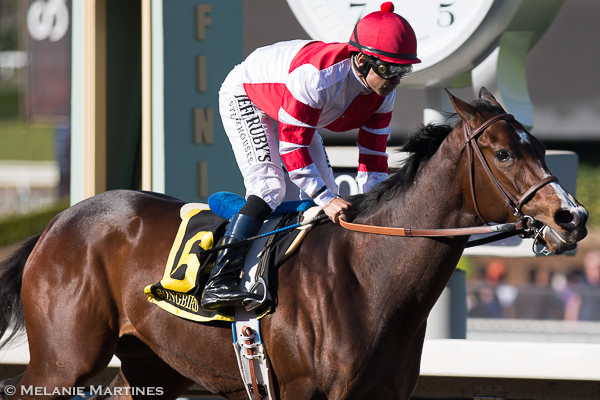 I think as he faces better horses, he'll only get better." "Every time we step forward I hope I can find the bottom... but I don't want to find the bottom of him until it's time." 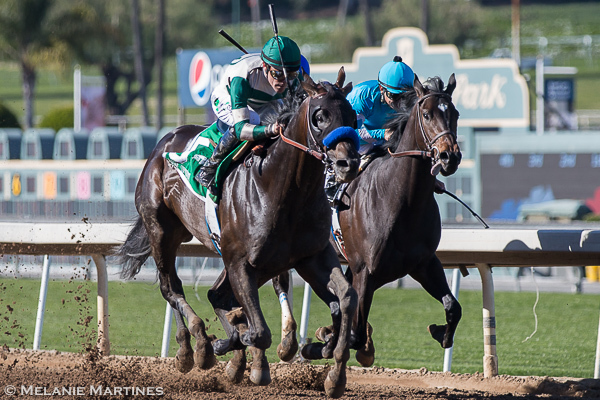 Mor Spirit easily cruises by Uncle Lino and I Will Score, and is on the road to the Santa Anita Derby. 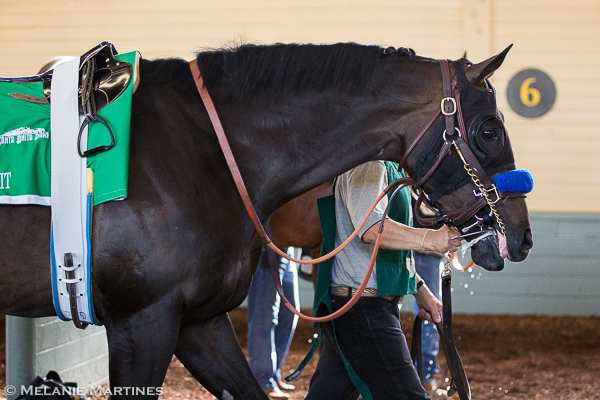 Trainer Bob Baffert on Mor Spirit, "He's a big strong horse so these races will help him. He holds his weight really well and he's a good-feeling horse. We just have to keep him healthy." Jockey Gary Stevens talking to Trainer Bob Baffert after the race. Have you ever heard Songbird by Fleetwood Mac? 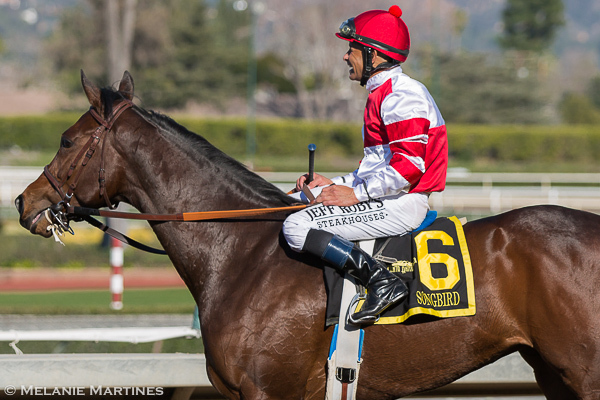 Well the beautiful lyrics remind me of the the super-filly, Songbird. Her graceful movements on the track are so endearing. I have always said she moves like poetry in motion. 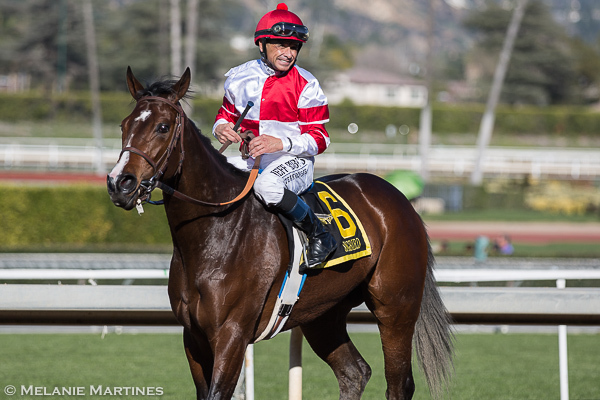 She has such a high cruising speed, her jockey Mike Smith says she has gears. 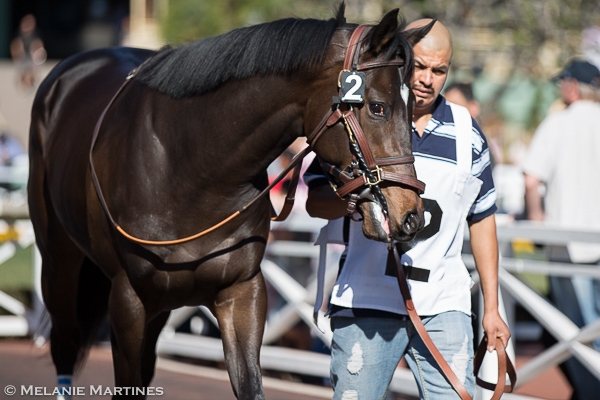 Race 5 was the 35th Running of the Grade 2 Las Virgenes Stakes and was her 2016 debut. 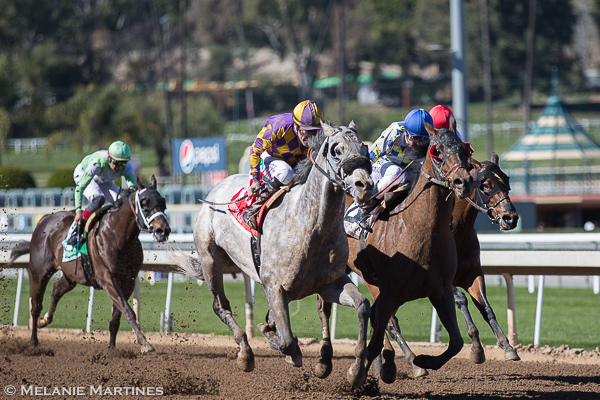 As you see in this photo it was deja vu all over again as the race looked like her previous starts. 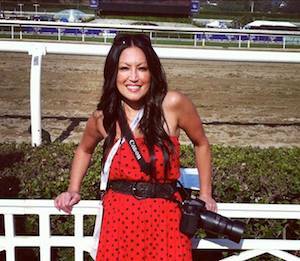 She led the field by 10 lengths at the top of the stretch, and made it look like a paid workout. 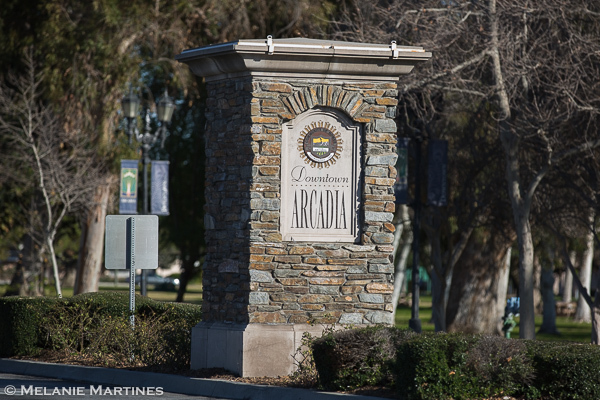 She galloped home under a hand-ride putting on a show for the fans who came out to see her. 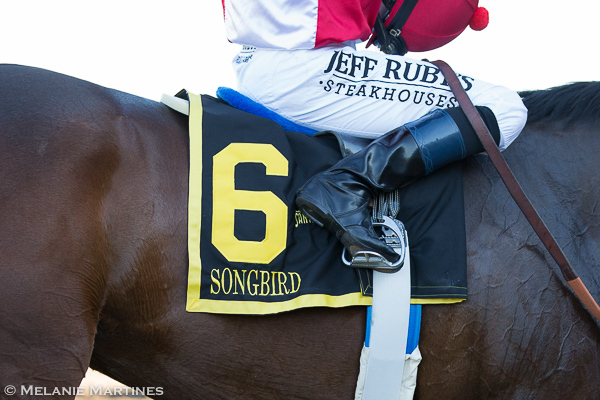 This was Songbird's fourth straight graded stakes win. Land Over Sea came in second with She's a Warrior coming in third. She floats on air and just makes things seem effortless. There are people who feel she is truly exceptional. 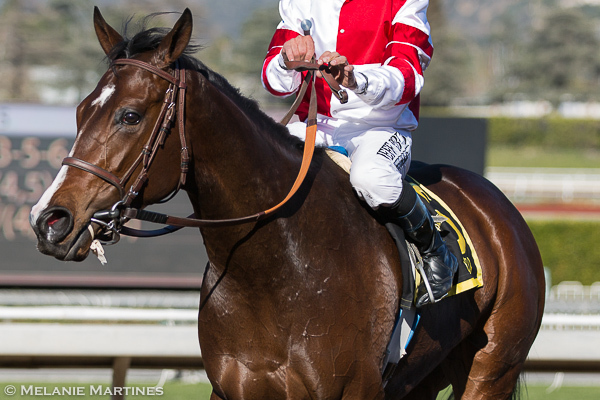 Her talent and heart could be measured up against any 3-year-old colt because many feel she is that good. Good enough to take on the boys and run for the roses. With running a filly in the Kentucky Derby many of you who follow the sport may remember a sad moment when Eight Belles tragically broke down shortly after crossing the wire, after finishing second to Big Brown in 2008. 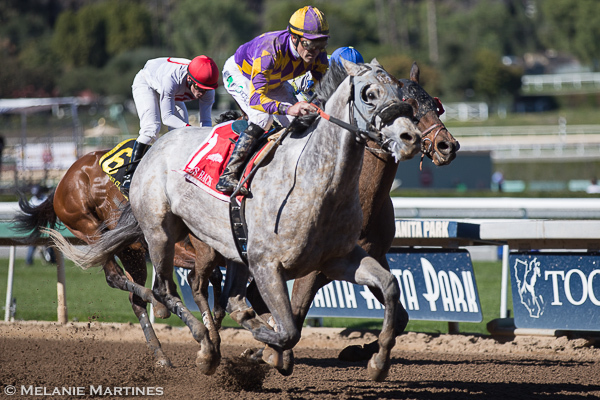 Controversy followed immediately after this catastrophic accident; as well as connections second guessing themselves on running Eight Belles against the best colts in the country. 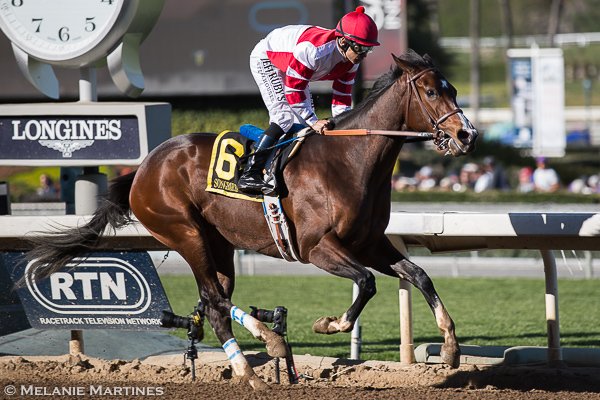 Ironically, Songbird's owner Rick Porter was the owner of Eight Belles. 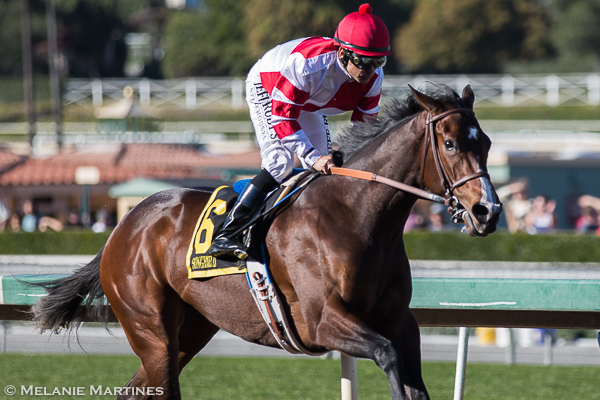 He's made it clear after the Las Virgenes, that there were no plans for Songbird to take any path to the Kentucky Derby. 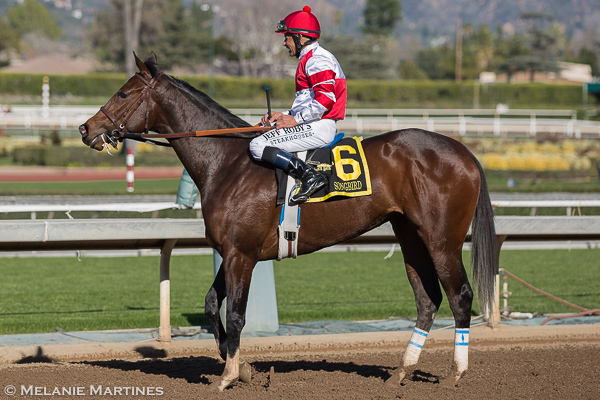 Instead he plans to stay on the path they are currently on with hopes of making it to the Kentucky Oaks. 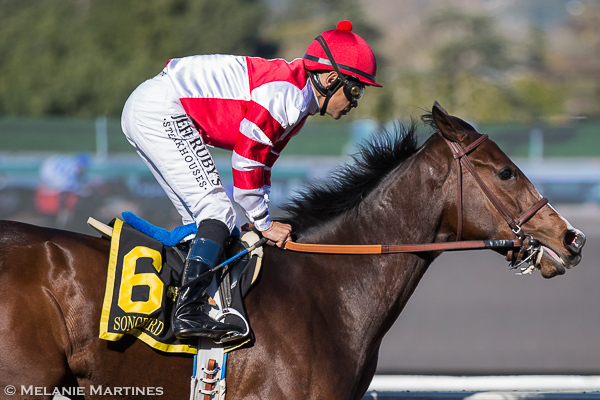 If Songbird's connections would consider running her against the males, do you think she has what it takes to compete against 19 of the best 3-year-old-males in the country? Many of you will agree, because I personally think she is as good as any colt in training right now. 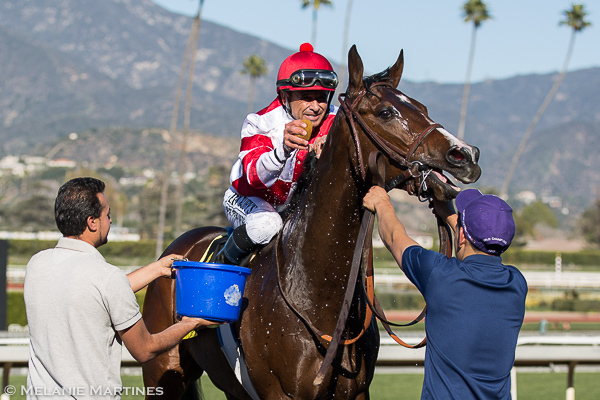 Jockey Mike Smith cooling Songbird down. 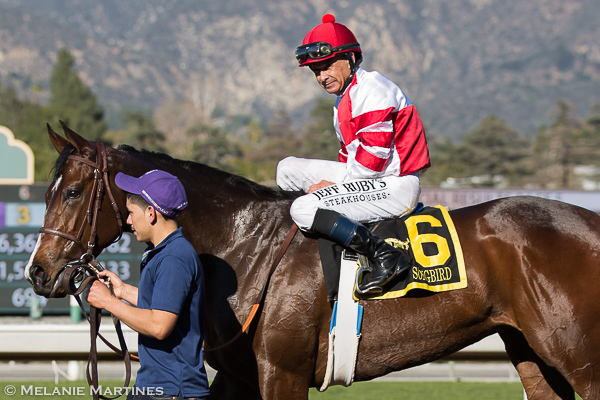 Songbird's owner Rick Porter, of Fox Hill Farm. 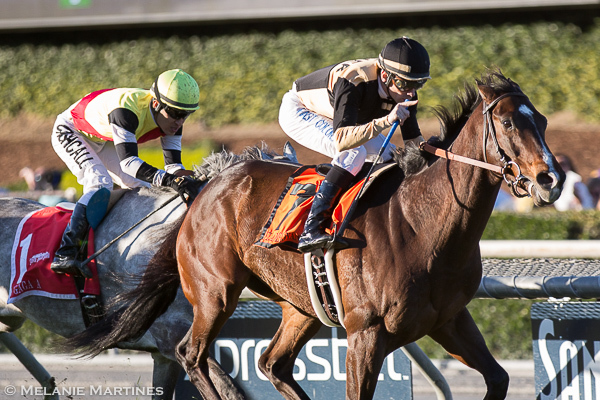 Race 7 was the 79th Running of the Grade 2, San Antonio Stakes. 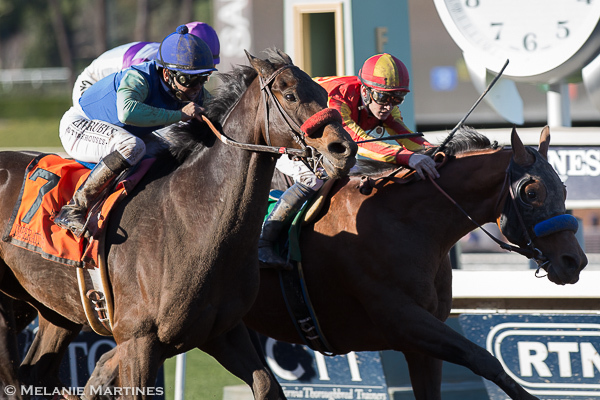 After a year of near misses and finally bringing his "A" game, Hoppertunity (on the inside) edges #7 Imperative by a nose in a thrilling photo finish! Donworth prompted the pace for third. 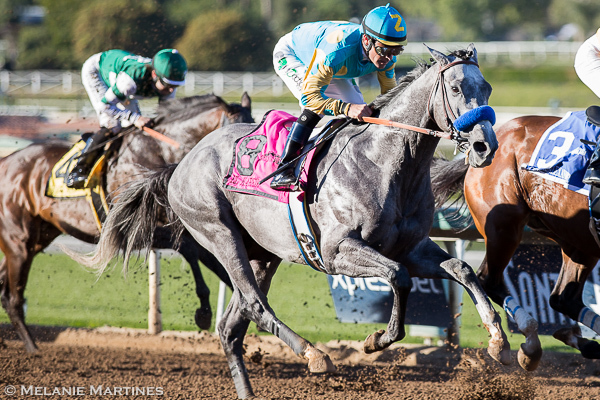 I had to capture a shot of #8 El Kabeir. Unfortunately he did not run well (ran second to the last). He just really hasn't been the same since he was injured. Interesting that all of Hopportunity's regular riders choose to ride elsewhere. First time riding Hopportunity in a race, Jockey Flavien Prat, "I thought I was beat to tell you the truth." 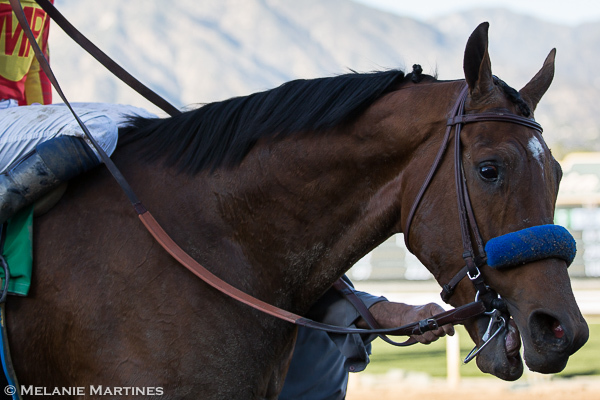 Trainer Bob Baffert, "It was a good prep for him for Dubai (World Cup on March 26)." 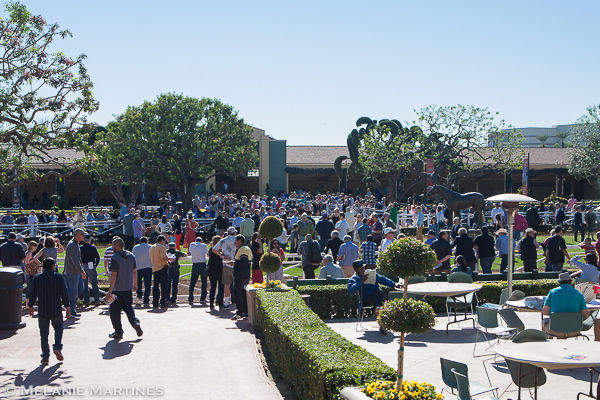 Race 8 was the 64th Running of the, Grade 2 San Marcos on the turf. 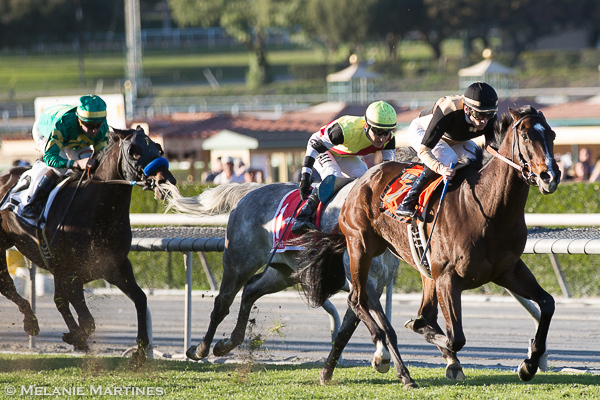 It was a wide open scramble turning for home, Flamboyant and Jockey Brice Blanc took command in the final furlong. #1 Gaga A a Uruguayan-bred and the only female in the field held on for second. 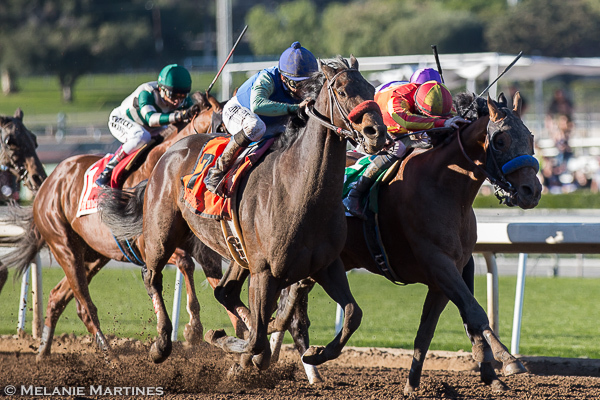 Last month, Flamboyant won the Grade 2 San Gabriel at odds of 46-1; this time he proved that the win was no fluke. Flamboyant after the race, heading back to the barn, now a winner of two grade 2 races. 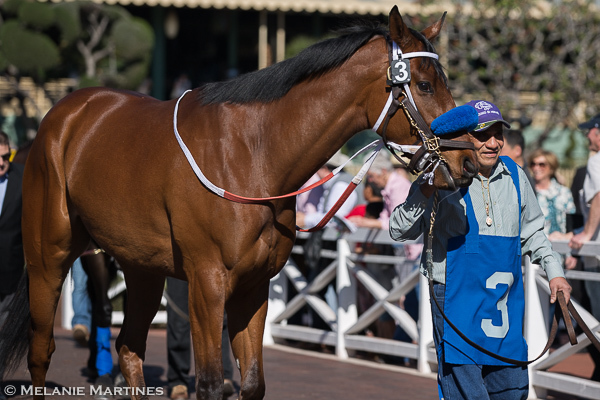 On Sunday Nyquist was scheduled for his final drill before Race 1 in preparation for his 2016 debut in the Grade 2, San Vicente on Monday, February 15th. 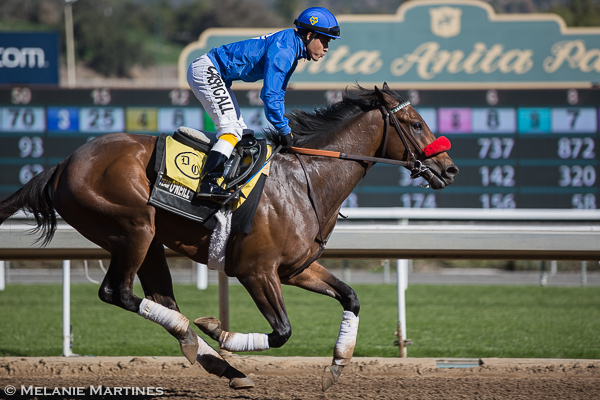 Champion Nyquist worked in company with Stablemate Bad Read Sanchez going 5 furlongs. 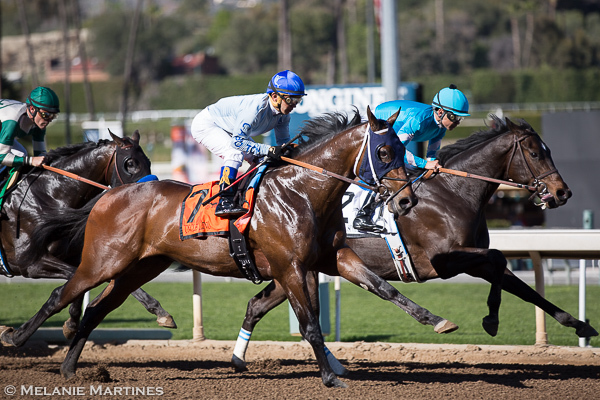 The only graded stakes race on Sunday was the Grade 2 Palos Verdes Stakes. A sucker for gray horses I am just mesmerized by their beauty. In the race, Kobe's Back broke a bit slow and settled way back in the field. This is a horse that has a tendency to get in trouble, and as far back as he was you're thinking there is no way he's going to make all that ground. 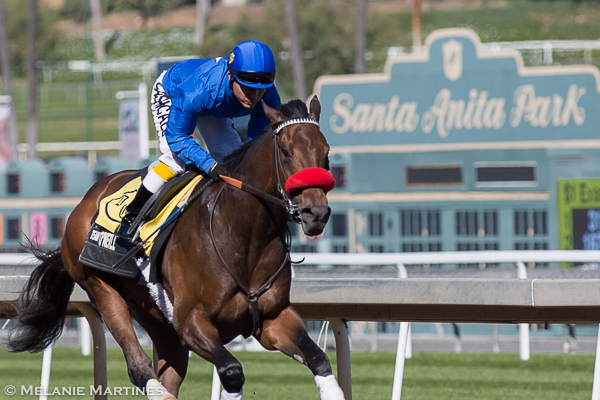 Much to everyone's surprise he rallied going into the stretch and made up all that ground. 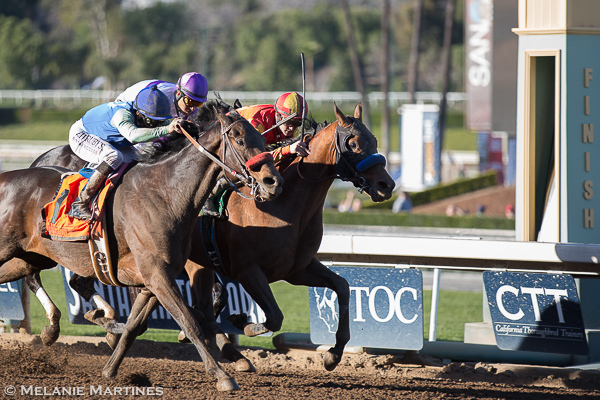 With his amazing acceleration, he nips Salutos Amigos by half a length to win the Palos Verdes. A horse that has been hanging for sometime, he was a deserving winner. I definitely love a horse that comes flying late! As the race day came to an end, I decided to get some peaceful shots of the track before leaving. 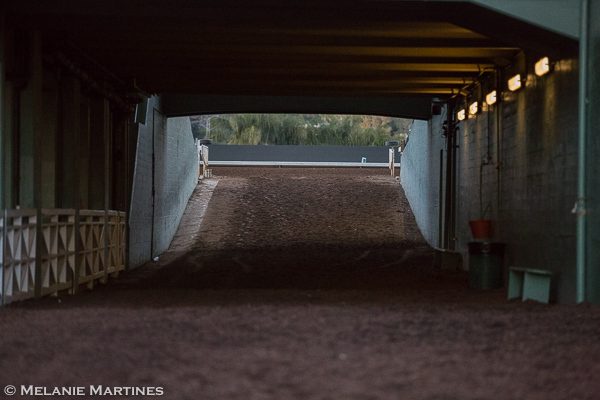 The tunnel that takes you onto the track is very busy during the races, and to see it so still, made for an intriguing photo. 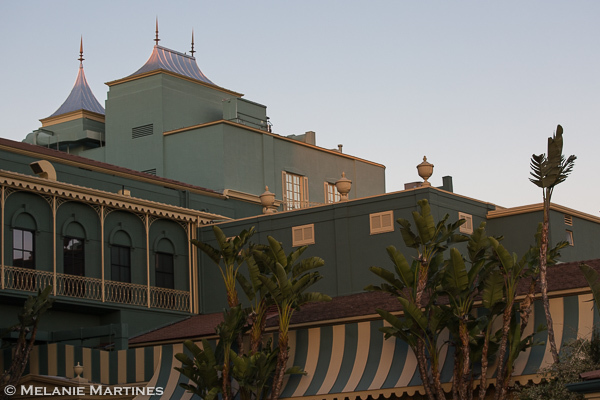 As the sun started to set, the golden hour shined it's rays. 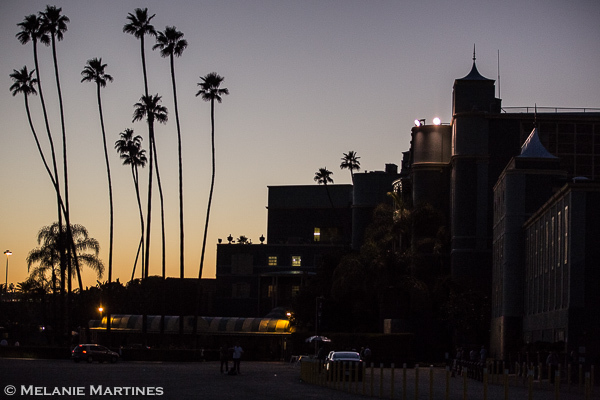 Another wonderful weekend at The Great Race Place, where the excitement never gets old. This is the time of year when race fans like myself get truly excited about the sport. 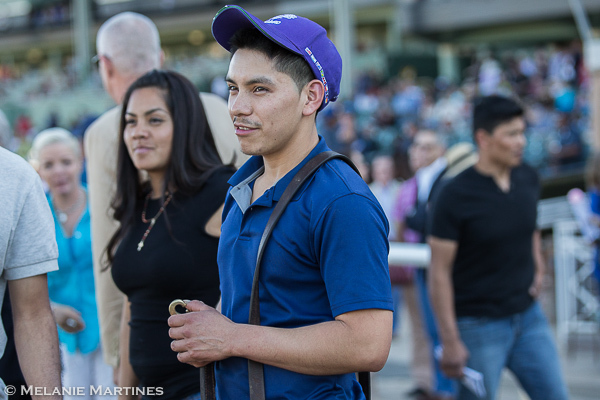 2015 was an amazing year for everyone in the industry, and I hope we can all create our own greatness and excitement in 2016, with racing from across the country! 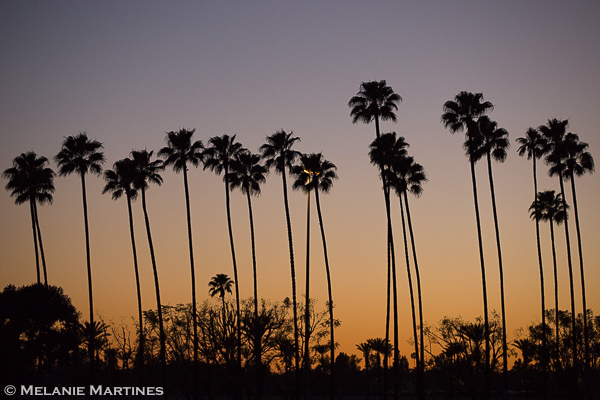 Good night Santa Anita, until we meet again!